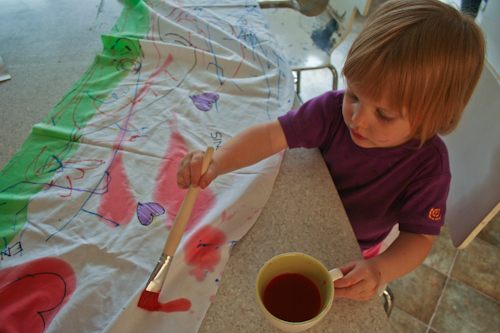 The girls have been asking for opportunities to do some more painting, and I was motivated enough by the thought of new, colourful skirts to walk them through this activity. 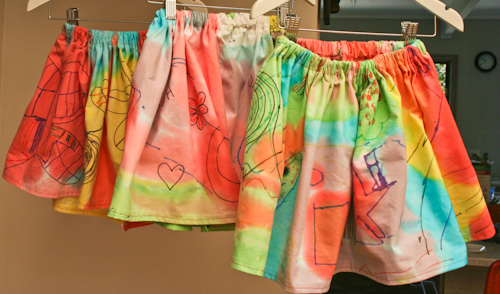 I let the girls draw and paint on a length of fabric and then sewed it to make three entirely unique skirts. 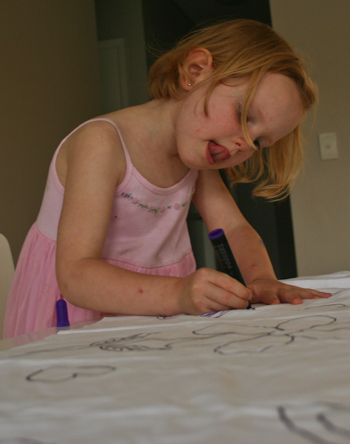 I started with a plain cotton pillowcase from an op-shop: $1. 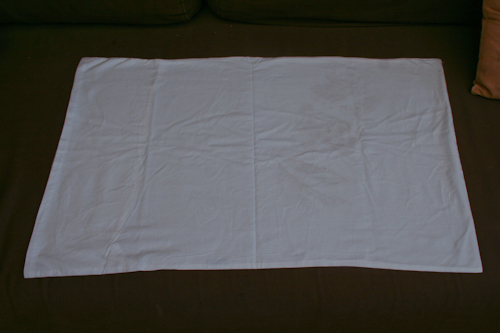 I cut the seams off the lengths, making one very long strip of white cotton. 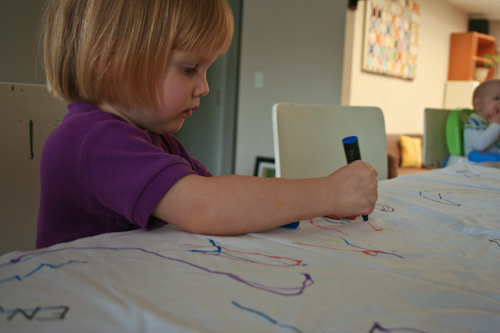 Using fabric markers, the girls were free to draw on the cloth. Later I discovered that the fabric markers soaked through the cloth and onto my countertop, so protect your surfaces first before laying out the fabric! I added some of my own pictures to encourage the girls' creativity. Brioni liked to colour in my simple drawings. Calista was more interested in drawing on her own hand. 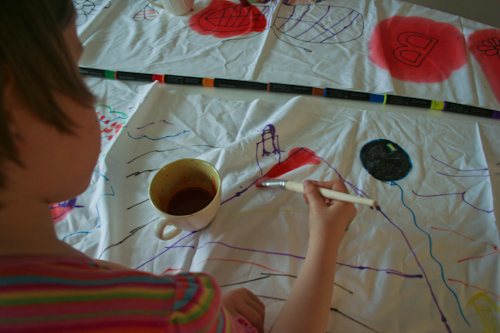 And Aisha drew very complex pictures on her cloth. Finally it was time to start painting the fabric. The paint was very watered down and created the effect of washed colour rather than precise strokes. I offered the girls several different colours of paint. As we started to run out of paint, I started to combine the colours to create new shades. The girls started by colouring in their pictures. In the end, they were just trying to cover every square inch of the cloth with a riot of colour. I enjoyed the interesting sensation of painting the fabric too. The paint would bleed freely, covering a wider area than the brush-stroke, so precise lines were not possible. 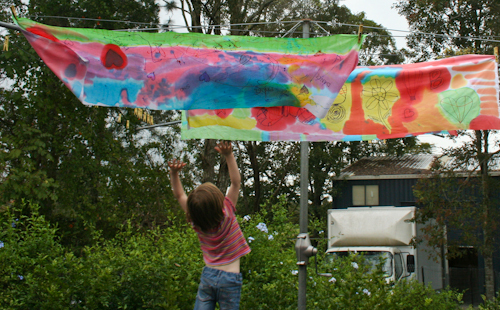 It was hard to resist playing with the skirt material while it was drying on the line! Once the fabric was dry, I brought it in and ironed it to help the colours set well. Then I folded over the seams to begin sewing the skirts. 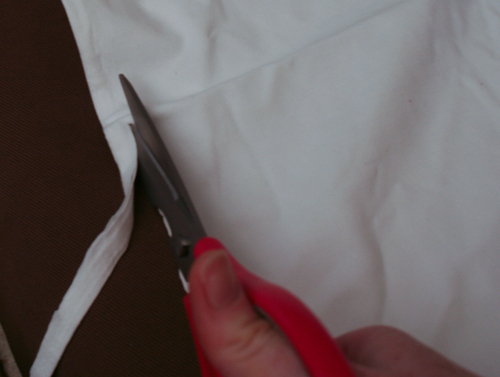 Fold and sew the bottom and top hems (with room for an elastic in the top). After sewing the hems, I threaded through the elastic for the waist, and they were done! Three beautiful, individual skirts, awash with colour! 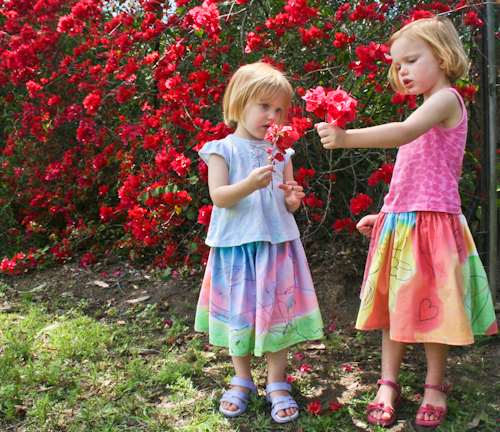 The girls were delighted to finally be able to wear their skirts. The idea for this project came from my new favourite inspirational blog: Filth Wizardry. Swing on by and check out Lindsey’s projects — she’s so creative! Did you have to use a special paint, so that it won’t wash out? oh wow! That is so clever and creative! I am interested too in the type of paint you used. BTW, is there a way to receive follow up comments from your blog as I don’t see how to read any f/ up comments without coming back here to view them? I have been collecting materials to do this since August and just haven’t found time. (All my permanent markers were dead.) I also want to do the Sharpie tie dye (draw with sharpies and then spray with alcohol.) 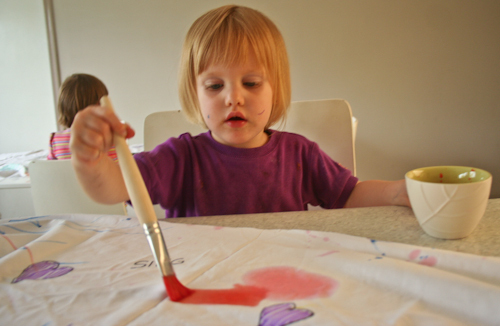 I am actually planning on doing something similar with my stained cream kitchen curtains— planning to paint huge red peonies on them with a green background. I just love this idea! Those pillowcases look like they provided the perfect amount of gather. I hope you don’t mind but I linked to you post on one of my blogs. Next time I can get to spotlight I will have to have a look for some supplies. What a lovely idea. I think my girls will love this is well. 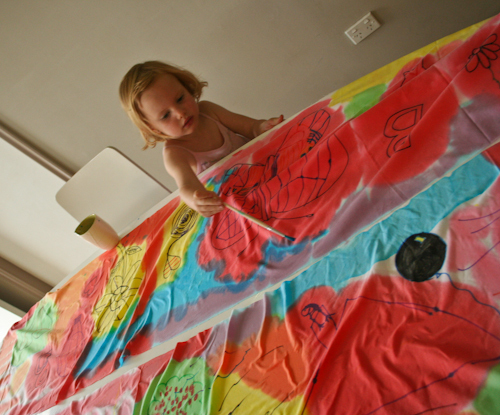 Gorgeous – I would love to do this at preschool, perhaps using an old sheet to become a wall hanging. What type of paint did you use? That is awesome. I can imagine some really groovy shorts for T made like that. I just need to wait until his attention span is up to it.